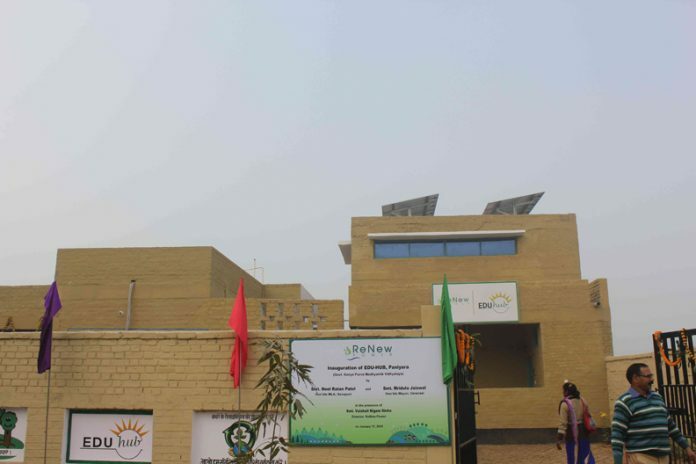 Empowering Rural India through Edu-Hub - a project by ReNew Power Ltd, near Varanasi in Uttar Pradesh has been awarded the coveted 5-Star SVAGRIHA Rating by the Green Rating for Integrated Habitat Assessment (GRIHA) Council. Empowering Rural India through Edu-Hub – a project by ReNew Power Ltd, near Varanasi in Uttar Pradesh has been awarded the coveted 5-Star SVAGRIHA Rating by the Green Rating for Integrated Habitat Assessment (GRIHA) Council. Edu-Hub is an initiative undertaken by ReNew Power to support talented rural children and youth, by promoting digital literacy, encouraging sports talent through scholarships & imparting skill training to villagers besides disseminating vital community information.